Hellboy 2s writer/director Guillermo del Toro has accomplished a rare feat by creating a sequel superior to the original, which itself was a solidly entertaining film. 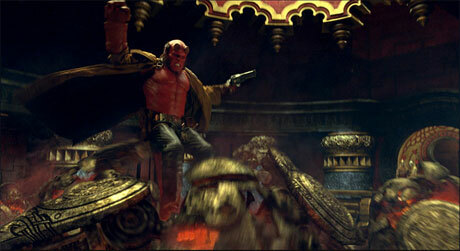 The fantastical mythology of Hellboys universe, which was only glimpsed in the first movie, is brought to the forefront here, creating a film that is as much a fairytale as it is a superhero action movie. Guillermo, whose ability to bring imagination to life was showcased in the Academy Award winning Pans Labyrinth, is given free rein to create one of the most elaborate and intriguing cast of creatures ever committed to film, rivalling the likes of Peter Jacksons The Lord of the Rings and George Lucass Star Wars. The origins of Hellboy (Ron Perlman) were explored in the first film but for those unfamiliar with the franchise, to recap: a group of Nazi magicians summoned an infant demon from the depths of hell. Allied troops rescued the creature and named him Hellboy, raising him in a secret government facility and teaching him to protect humanity from paranormal invasion. Hellboy, along with his pyrokinetic girlfriend Liz (Selma Blair) and fish-man Abe Sapien (Doug Jones), are part of a team of super-creatures that secretly work for the American government to keep the world safe from monsters. Hellboy 2: The Golden Army revolves around an ancient legend that tells of a coming war between the humans and the creatures of the underworld, led by the King of the Elves (Roy Dotrice). Before recorded history, an army of giant golden warrior machines were created to destroy humanity but after witnessing the carnage caused by the clockwork creatures, a truce was struck between the elves and the humans and the golden army was decommissioned. Now, thousands of years later, the Prince of the Elves (Luke Goss) has returned to renew the battle with humanity and Hellboy and his team are called in to save the day. Guillermo balances humour, action and intricate storytelling in a way thats rarely seen in big budget Hollywood blockbusters. But every superhero movie, like every superhero, has a weakness. Hellboy the character and Hellboy 2 the movie suffer from the same kryptonite, which is pointed out in the film by the ectoplasmic spirit Johann Kraus (voiced by Seth MacFarlane)  Hellboys anger gets the best of him. Hellboys first instinct in any situation is to punch his way out, which leads to a few too many immaculately choreographed fight sequences. In a lesser superhero movie these fight sequences would be the reason to lay down your hard earned money but del Toro and Hellboy creator Mike Mignolia have created such an interesting story that the action sometimes feels like a distraction.